Stacy Kortan, left, and Emily Salstrand with Alice Friedlander. 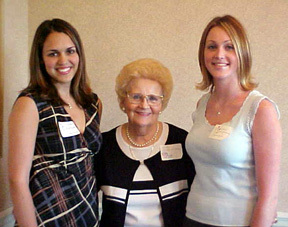 Three UNMC students -- Amanda Kent, Stacy Kortan and Emily Salstrand -- have been selected as recipients of the 2003-2004 Alice Friedlander Scholarships. The Scholarships are funded by The Nebraska Medical Center-University Hospital Auxiliary to honor Alice Friedlander, who directed the volunteers at UNMC from 1972 to 1990. 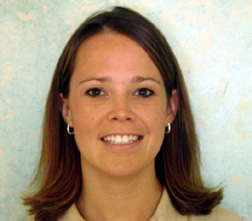 Amanda Kent, a student in UNMC's physical therapy program, is a graduate of the University of Nebraska-Lincoln (UNL). As an undergraduate, she served as president of her sorority, Kappa Delta, and was a delegate to the National Convention. She has volunteered in the elementary school setting as a mentor for the Partners in Learning Program, as a helper during the school fun nights and as a classroom helper with reading and math. She currently serves as co-chair of the Nebraska Student Special Interest Group, an organization for physical therapy students in Nebraska. Kent also is a very active member of the Students of University of Nebraska-American Physical Therapy Association (SUN-APTA). She has received her greatest satisfaction from her time spent as camp counselor at Camp Kindle for the past two years. The camp is for children ages 7 to 17 years who are infected, or affected by HIV or AIDS. The experience builds trust and confidence in the children and Kent finds this very gratifying. "Her work and volunteer activities consistently benefit those in need," said one of Kent's teachers. "She is personable, disciplined, empathetic and committed to the world outside herself." Stacy Kortan is from Sioux Falls, S.D., and just completed her junior year in the College of Nursing at Lincoln. She plans to get her bachelor of science degree in nursing and then spend one year as a traveling nurse before pursuing her master's degree. She is very active through her sorority, Kappa Alpha Theta, acting as finance deputy, serving on several committees and participating in many fund-raising activities. Kortan assists the College of Nursing with recruitment activities, meeting with perspective students and their families. Her community involvement includes volunteering at the Sioux Falls and the Lincoln soup kitchens, as well as helping with a Lincoln elementary school's carnival. Last summer she was softball coach for girls under 6 years old and for the past 15 years has played softball during the summer. The Coordinator of Student Services in the College of Nursing says: "(Staci) is one of the most outstanding students that I have ever had the pleasure of working with. Staci's solid academic credentials, co-curricular and leadership experiences and commitment to making her community a better place make her a strong candidate for the Friedlander Scholarship." Emily Salstrand of Lincoln attended UNL and just completed her junior year at UNMC as a radiography student. While a student at UNL, she participated in community service activities and fund-raisers sponsored by her sorority, Chi Omega. The activities introduced her to various health-care opportunities, including NU on Wheels, the American Cancer Society and the Make-a-Wish Foundation. Salstrand's most rewarding volunteer experience is as a member of the Nebraska Human Resources Institute (NHRI), which is a three-year mentoring program to aid in the development of leadership skills. As chairperson of the Roper Elementary School branch of NHRI, she organized parent and student retreats, community service activities and assisted in the classroom. Seeing young people develop confidence, friendships and intellectual ability was a fulfilling experience and one that also developed opportunities for her own personal growth. "Emily is a true team player," said her clinical education coordinator in radiography. "She is always offering assistance to peers, staff, and patients. Emily is a genuinely empathetic person and someone you would want to care for your family member." To be considered as scholarship nominees, students must have 1) completed at least one year of study by the start of the scholarship year; 2) maintained full-time student status during the course of the scholarship year; 3) maintained at least a 3.3 grade point average; 4) had a history of involvement in volunteer activities or community service; and 5) showed a need for financial aid.